From 2007-2011 this blog was mainly about my animals with a bit of off-topic chatter. Then my husband shocked me by confessing to an affair. We've divorced. Life is better than ever! Calypso loves corn. Last night, the rest of the parrots had come into the kitchen with Thomas and me, and Calypso was alone in the living room. We'd already fed the parrots their dinner, which included some chunks of corn on the cob. Calypso, who usually stays on his own cage, flew around to a couple of other cages and ate the other parrots' corn! He was already working on emptying it out again. I know there is a forager in him! I love cherries and bought some incredibly tasty ones from my favorite farmer. All of the parrots except Max also like them. Here's Thomas feeding Stella: With cherries, because their juice really stains, we try to hold the cherry instead of letting the parrot fly all over the house and make a mess! Could this squirrel be any more adorable? I hope everyone has a great weekend! I'm supposed to run 17 miles tomorrow. And the weather forecast is not looking promising. Rain!!! Your cherry comment reminds me of the terror that is also associated with seeing parrot poop after the parrot has eater cherries, blueberries or beets. No, there is no internal hemorrhaging, just digested fruit. Good point! Max used to eat Zupreem pellets, and she'd only eat one color per day, so her poop was different colors every day. I totally freaked out about that, too. Yes, Harley arrived eating Zupreem pellets, and we kept having red days. RED DAYS. I don't think we even finished the bag. Still, pomegranites (which I've given up trying to spell) can do the trick, too. I remember when we first gave Jasmine some blueberries, soon after we got her. Her cage looked like the scene of the St.Valentines Day Massacre when she'd finished. Oh boy, did we learn our lesson that day! And yes, the first time she ate beets, we had another moment of panic. It's great to see that Steve seems to be gaining in confidence. Sorry you had to go through that, but glad to know I'm not the only one who panics at such sights! 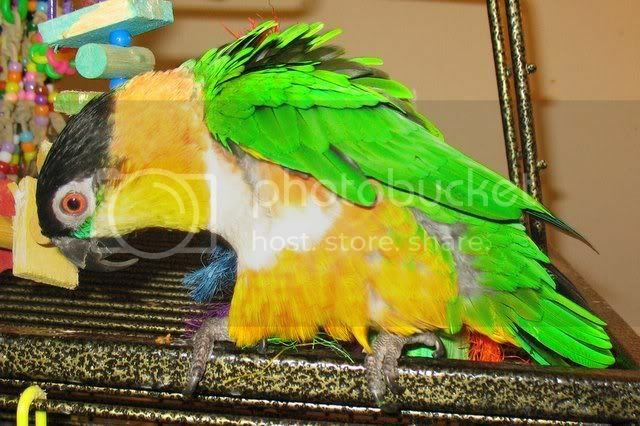 I have some similar pictures of Minnow, our white ear conure, with corn all over her beak. She seems to enjoy it as much as the rest of the family. I think she'll be upset when she realizes sweet corn is seasonal. Carrie -- I wonder if she is a corn snob -- you might be able to get her to eat the frozen stuff, like Joey does? Calypso is pretty much a corn snob, though, so he only gets it seasonally!